For comparability with other cities around the world, Newcastle has been defined as the City of Newcastle together with the neighbouring City of Lake Macquarie to the south, the urban and semi-urban parts of the City of Maitland to the northwest and those suburbs in the Port Stephens Local Government Area to the northeast that are near the Newcastle airport. This area extends from Rutherford, Morpeth, Raymond Terrace and Williamtown in the north to Wyee and Catherine Hill Bay in the south but excludes the detached Cessnock area to the west. Of the names of the 180 suburbs and neighbourhoods located to date in the Newcastle-Lake Macquarie-Maitland-Raymond Terrace area, 54 (30.0%) are based wholly or in part on place names that can be found in Scotland, on Scottish family names or on Scottish words. Of course, many of the names are used in other parts of the British Isles as well but at least 28 (15.6%) of these appear to have a direct or indirect connection with Scotland. 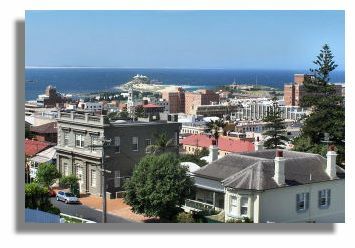 Picture of Newcastle NSW via Wikipedia. Balcolyn - According to the Newcastle City Council's Library website, this appears to be a made-up name based on the Scottish prefix 'Bal' (from baile, the Gaelic word for 'town') and the personal name Colyn. 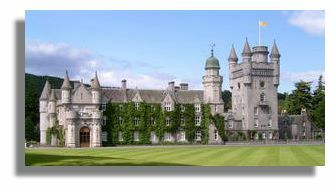 Balmoral - One presumes that this suburb was named for Balmoral Castle (seen here), the royal residence built for Queen Victoria on the river Dee in Aberdeenshire. Belmont, Belmont North and Belmont South - During the 19th century, Belmont was an extremely popular choice of name for places throughout the English-speaking world, its origin being Italian or Norman French ('beautiful mountain'). According to Kennedy & Kennedy (2006), the Lake Macquarie suburb of Belmont and its extensions were named for the village of Belmont on the island of Unst in the Shetland Islands. The name was bestowed by Thomas Williamson, a settler from the Shetlands, in honour of his home-town. This is a rare instance of Belmont having a Scottish origin - its namesake in Perth, Western Australia, for instance, is attributed to a place in England. Cameron Park - there are places called Cameron in Fife, North Lanarkshire and West Dunbartonshire. Cameron is an ancient Scottish family name, the origin of which has been speculated to mean either 'curved hill-brow' (Old Welsh) or, more probably, 'crooked or wry nose' (Gaelic). Formerly known as Estelville, the name of this suburb was changed in 2000 to Cameron Park after the nearby speedway of that name. The speedway itself had been named for Ian Cameron, one of the founders of speedway racing in Australia. Charlestown (Aberdeenshire, Fife, Highland, Moray and Perth & Kinross). The picture is of the Elgin Hotel in charlestown, Fife. The name also occurs in England and Ireland, however. According to the article on Charlestown, NSW, retrieved from Wikipedia in March 2007, the name is attributed to Charles Smith, manager of the Waratah Coal Company in the 1870s. What is today Charlestown was the area where the coal mining company sank its first shaft in 1873. Officially called South Waratah, the pit was variously known as Charles' Pit, Raspberry Gully or The Gully Pit. Charles Smith (1816-1897) was born at Kirriemuir, Forfarshire, Scotland (Australian Dictionary of Biography). Fassifern - there is a village west of Fort William on Loch Eil in the Highlands called Fassfern, after which this suburb is believed to have taken its name (Kennedy & Kennedy, 2006, p. 100). The Geographical Names Board of NSW, however, suggests a more prosaic origin to do with the large number of ferns growing in the area. The Scottish connection seems the more plausible explanation, despite the slight difference in the spelling of the name in Scotland. The official Gaelic name of the Highland village is 'An Fasadh Fearna'. Fletcher - Fletcher is certainly a Scottish family name. There is a Fletcher tartan (seen here) and there is also a Fletcherfield in Angus possibly associated with the Fletchers of Innerpeffer. Since the origin of the name is purely occupational (meaning arrow-maker) it is hardly surprising that Fletcher is also found as an element in at least twelve place names throughout England, for example Fletchersbridge in Cornwall and Fletcher's Combe in Devon. One wonders whether this Newcastle suburb was named for James Fletcher (1834-1891), coalminer and owner, newspaper proprietor, politician and 'friend of the miners', who was born at Dalkeith, East Lothian, Scotland. Fletcher managed the Minmi collieries for a while, was part owner of Ferndale colliery, mayor of Wallsend in 1874-75 and the member for Newcastle in the Legislative Assembly (Australian Dictionary of Biography). Since the suburb lies between Wallsend and Minmi, it is highly likely that it owes its name to James Fletcher. Fullerton Cove - According to the 'Hunter Valley Place Names and their Meanings, Newcastle City Council Library' website, this suburb on the north shore of the Hunter River was named for an individual rather than a place. The name apparently recalls a Scottish traveller and soldier, Colonel William Fullarton (1754-1808), who was a member of a three-man commission that governed the Caribbean island colony of Trinidad in 1803 and 1804. The family home, Fullarton House, was in South Ayrshire but fell into disrepair and was demolished in 1966 - see Parks and Activities South Ayrshire.. Colonel Fullarton's connection with the Newcastle area is unclear, nor has a reason for the change in the spelling of the name been found. Gillieston Heights - there is a Gilliestongues in the Scottish Borders, Gillies Hill in North Ayrshire and Stirling, and Gillieselly and Gillietrang in the Orkney Islands. There is also a Gilliehill Clints just over the border in Northumberland. Formerly known as East Greta, the name was changed to Gillieston Heights in 1967 as the result of a poll by local inhabitants. The name commemorates John Gillies, a popular mayor of West Maitland in the late 19th century and a member of the Legislative Assembly for the district (Geographical Names Board of NSW). John Gillies (1844-1911) was born at Airdrie, Lanarkshire, Scotland and arrived in Sydney aboard the 'General Hewett' when he was four years old, his family settling in West Maitland (Australian Dictionary of Biography). Glendale (Highland) - This name proved to be a popular one during the 19th century, especially in North America. The unusual feature of the name is that it is a tautology since it is based on two words (the Gaelic gleann and the Norse dalr) which both mean 'valley'. The Lake Macquarie History of Suburbs website suggests that the name is a made-up one, with the explanation that "glen is a Scottish term for a valley between hills, usually with trees, and dale is an English term for a valley between hills." Hamilton, Hamilton East, Hamilton North and Hamilton South - The name Hamilton has been associated with Scotland since the thirteenth century, probably having been taken there by Walter Fitz Gilbert (Sir Walter de Hameldone). Hameldome/Hamelton was the name of Sir Walter's estate in England. According to the Penguin Dictionary of British Place Names (Room, 2003), Hamilton in Old English means 'farmstead in broken country'. 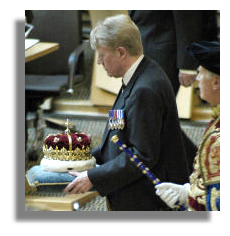 (The illustration here is of the Duke of Hamilton carrying the Crown of Scotland at the official re-opening of the Scottish Parliament in 1999). The Newcastle suburbs were named for Edward William Terrick Hamilton (1809-1898), pastoralist and company director, who was born on 26 November 1809 at Loughton, Essex, England, son of Rev. Anthony Hamilton (1778-1851) and his wife Charity, née Farquhar (Australian Dictionary of Biography). An indirect connection with Scotland therefore seems quite probable, although the immediate link is with England. Heatherbrae - there is a Heatherbrae Hotel at Nethy Bridge in the Strathspey region of the Scottish Highlands, while a street in Bishopbriggs, Glasgow is called Heatherbrae (as are two streets in two southern English cities!). This Scottish name literally means 'the hillside where heather grows'. Lake Macquarie and Macquarie Hills - The City of Lake Macquarie was presumably named after the lake. The lake was named in 1826 in honour of Governor Lachlan Macquarie (1761-1824), "the Father of Australia", who governed New South Wales between 1809 and 1822 and who was born on the island of Ulva in the Inner Hebrides, Scotland. The lake had previously been known as Reid's Mistake after a sea captain who thought he had arrived at the Hunter River (Geographical Names Board of NSW). Largs (Ayrshire). The Maitland suburb was indeed named after the town in Ayrshire, according to an article published in the Royal Australian Historical Society Journal, Vol 39, Pt 3, p.132 (Geographical Names Board of NSW). Lorn (Argyll & Bute and West Dunbartonshire) - Lorn takes its name from the McDougall family estate on which this Maitland suburb now stands. The estate, in turn, had been named for Lorn in Argyllshire (pictured here) (Newcastle City Library). Maitland, East Maitland and South Maitland - Maitland is the name of a place in South Ayrshire. 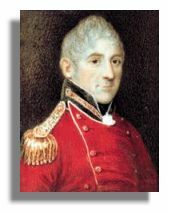 According to the Newcastle City Library website, the City of Maitland was named after General Frederick Maitland, a grandson of the sixth Earl of Lauderdale, who fought in the Peninsular War. Murrays Beach - Murray is one of the best known Scottish family names, derived from the name of the area (Moray) in which the Pictish founder of the clan was granted land. Examples of places in Scotland based on this name include Murray's Hill (Perth & Kinross), Murrayfield (Edinburgh), Murraythwaite (Dumfries & Galloway) and many others. The name has also travelled to England, e.g., Murray's Rock in Devon and is claimed as an Irish name as well. Pitnacree (Perth & Kinross) - According to the Newcastle City Library website, the Maitland suburb was named by the Rev. William McIntyre after his home on the River Tay in Scotland (presumably the village in Perthshire). Rankin Park - there is a Rankinston in East Ayrshire and Rankin's Rocks in Argyll & Bute. Black (1996), the authority on Scottish family names, considers Rankin and its variants Ranken and Rankine to be derived from pet forms of a name such as Randolph. The early home of the Rankins was in Ayrshire. Black adds that people with the surname Rankin were small proprietors before the end of the 16th century. This suburb perpetuates the name of the late Mr A.A. Rankin, a prominent Newcastle solicitor and long-serving president of the board of the Royal Newcastle Hospital (Hunter Valley Place Names and their Meanings, Newcastle City Council website). It is not known whether A.A. Rankin's ancestry was necessarily Scottish. Speers Point - Speers is a Scottish family name from Renfrewshire, one of the many variants of Speir or Speirs, which Black (1996) says could be from 'spyer' or watchman. The Scots word 'speer' means to ask, enquire or question. The suburb was named for William Speer, a wealthy 1870s businessman and former MP from Sydney who settled in the area. Variations in the spelling of his name have occurred such as Speerses and Speirses (Newcastle City Library). William Speer's ancestry has not been reported but may well have been Scottish. Some of the following suburbs and neighbourhoods are also likely to have a direct or indirect Scottish connection, but these names are associated with other parts of the British Isles as well. Ashtonfield - Ashton is the name of a village in both Highland and Inverclyde, but the name is found more commonly in England and also occurs in Wales. No information is available on the origin of the name of this Maitland suburb. Cooks Hill - there is a Cookshill in Aberdeenshire. However, a place with this name can also be found in the English county of Staffordshire. As a surname, Cook is both Scottish and English, the Scottish Cooks being a sept of Clan Stewart. The suburb was named after Tom Cook, a wealthy squatter, who lived in a cottage at the corner of Auckland and Laman Streets, Newcastle (Hunter Valley Place Names and their Meanings, Newcastle City Council Library website, citing Social Sciences Teacher Vol 13 (5), 30th November, 1983). Tom Cook's ancestry has not been reported. Greenhills (North Ayrshire and South Lanarkshire) but places called Greenhills are found more commonly in England and there is also a suburb of Dublin with this descriptive name. Highfields (Argyll & Bute). However, this name is far more commonly encountered as a place name throughout England. Maryville (City of Glasgow) also a suburb of Cork, Ireland. The connection is not necessarily Scottish, however, since the suburb owes its name to the wife of James Hannell, Newcastle's first mayor in 1859 (Wikipedia article on Maryville, NSW). Mount Dee - Dee is the name of the river in Aberdeenshire on which both the City of Aberdeen and Balmoral Castle are situated, as well as a river in Dumfries & Galloway. However, there is also an important river in North Wales called the Dee, which enters England at Chester. Considering the large number of Welsh as well as Scottish place names in Newcastle and the Hunter Valley, the link with the name of this small Maitland suburb could be either Scottish or Welsh. Mount Hutton - there is a town in the Scottish Borders called Hutton. However, places with Hutton as an element in their name are very frequently found throughout England, especially in Yorkshire and Cumbria, while there is a place in Essex called Hutton Mount. As a family name, Hutton is considered to be both Scottish and English. The following explanation is given by the Newcastle City Library for the origin of the name of the suburb: "In 1956 a meeting of the local residents decided to call the area after Doctor Hutton, one of the early residents in the area. The mount came because of the hill at the back of the settlement." Rutherford (Scottish Borders) also in Durham, northern England. According to the Newcastle City Library website, the Maitland suburb was named after Dr George Shaw Rutherford, "the original grant holder who never actually settled in the area." Dr Rutherford was a surgeon superintendent on several convict ships during the 1820s and 1830s. He died in London in 1868, at the age of 82. No details on his place of birth are available. His brother, James, was also a naval surgeon (Australian Medical Pioneers Index). Thornton (Angus, East Lothian, Fife, Midlothian, Moray, Perth & Kinross and South Lanarkshire; also Thornton Burn in East Lothian, Thornton Hill in Perth & Kinross, Thornton Wood in Fife, Thorntonhall in South Lanarkshire and Thorntonloch in East Lothian). Thornton, however, is far more commonly used as a place name in England and is also found in Ireland and Wales. A final category of suburban names comprises places that can be found in Scotland but which, in Newcastle's case, definitely or most probably have no connection with Scotland. Black Hill (Aberdeenshire, Angus, Argyll & Bute, Scottish Borders, East Ayrshire, East Renfrewshire, Fife, Highland, Midlothian, Moray, North Ayrshire, North Lanarkshire, Perth & Kinross, Shetland Islands, South Ayrshire, South Lanarkshire, Stirling, West Lothian). Black Hill is found just as commonly in England and occurs in two Welsh counties as well. The Newcastle City Library website notes that the area was originally known as Wyabah, then The Mountain but in later years changed to the current name after the Aboriginal word Benwarrin meaning 'long hill'. A Scottish connection therefore seems improbable. Bolton Point - there is a Bolton in East Lothian as well as in five English counties, including the well-known industrial town of Bolton in Greater Manchester. According to the Newcastle City Council Library, Bolton Point was named after Major John Charles Bolton. Since Bolton is an English family name, an English rather than a Scottish connection is the more likely. Broadmeadow (West Lothian). Kennedy & Kennedy (2006) are of the opinion, however, that the name is descriptive of the area. This is quite likely since the area has also been known as 'The Broadmeadows' (Newcastle City Library). A link with the place in West Lothian cannot be entirely ruled out, however. 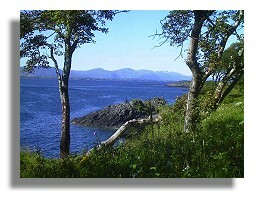 Carey Bay - there is a village in Perth & Kinross called Carey. However, there are also at least three places in SW England called Carey. As a surname, Carey is typically Irish. Carey Bay was named after William Cary of the Excelsior Land Investment and Building Company and Bank Limited (Wikipedia article on Carey Bay, New South Wales, October 2009). No explanation is given for the spelling Carey rather than Cary. Georgetown (Dumfries & Galloway, Moray and Renfrewshire) also the name of a town in Blaenau Gwent, Wales. The origin of the name is probably neither Scottish nor Welsh since it is attributed to George Moate. According to the Wikipedia article on Georgetown, NSW, Moate acquired land in the general area of Georgetown in 1853, which he subsequently subdivided. The settlement was originally called Geordie Town, "possibly because of the people from the north of England brought over to work at the English and Australian Copper Smelters, the site occupied now by A. Gonan & Co Ltd." (Newcastle City Council Library, citing Social Sciences Teacher, 13(5), 30th November, 1983). Lambton, New Lambton, New Lambton Heights and North Lambton - there is a village in the Scottish Highlands called Lambton. The Newcastle suburb was named, however, after the family estate, in the north of England, of the Earl of Durham (Hunter Valley Place Names and their Meanings, Newcastle City Council Library website, citing Social Sciences Teacher Vol 13 (5), 30th November, 1983). Several of Newcastle's suburbs in fact take their names from places in Northumberland and County Durham, and are usually connected with coal mining. For the record, these include Gateshead, Hexham, Jesmond, Killingworth, Lambton, Morpeth, Ryhope, Wallsend, Wickham and, of course, Newcastle itself. It is interesting to note that the Old Lambton Colliery was established in 1862 by the Scottish Australian Mining Company, which brought miners to the area from Staffordshire (Newcastle Regional Library). According to the Wikipedia article on Lambton, NSW, the mining company was managed by the Croudace brothers, Frank, Thomas and Sydney. Mayfield, Mayfield East, Mayfield North and Mayfield West - Mayfield is found in Aberdeenshire, Dumfries & Galloway, East Ayrshire, City of Edinburgh, Fife, Highland, Midlothian, North Ayrshire, Orkney Islands, Perth & Kinross, Shetland Islands and South Lanarkshire. Mayfield is also found throughout England but less commonly so than in Scotland. These suburbs have an indirect link with England rather than Scotland since they were named after May Scholey, one of the daughters of John Scholey, a Newcastle butcher who bought and subdivided the area in 1881 (Kennedy & Kennedy, 2006, p. 173). John Scholey (1840-1908), proprietor, businessman, colliery owner and mayor was born in Leeds, Yorkshire. Redhead - there are places in Angus, Highland, Orkney Islands and Shetland Islands called Red Head, the only occurrences of this name in the British Isles. It is unlikely, however, that this suburb was named for any of these places since, according to both Kennedy & Kennedy (2006, p. 231) and the Lake Macquarie website, the name comes from the reddish coloration of the headland, especially when seen from the sea. The Hill - places with this name can be found in at least two Scottish counties (Dumfries & Galloway and East Ayrshire) but the name is also popularly used throughout England, and is found in Wales as well. The reason for the name appears to be purely descriptive of its elevated situation in relation to the city centre (Newcastle City Library). Wakefield (Aberdeenshire and Scottish Borders). This suburb was named, however, after the large town of Wakefield in Yorkshire and thus has no connection with Scotland. Whitebridge (two villages in Highland). The suburb is said to have received this name when the bridge over the Belmont railway line was painted white (Lake Macquarie website). The link with Scotland might therefore be purely coincidental. The names of two further suburbs - Bonnells Bay and Croudace Bay - may prove, on further investigation, to have a Scottish link but substantiating evidence has not yet been found. Some sources suggest that the family name Bonnell originated in Scotland but that it is now more strongly associated with north east England. Croudace is said to be a family name from Dumfries, one of the many variants of Carruthers. Black (1996), the authority on Scottish family names, makes no mention of either of these names, however. Originally called Scarborough by Governor Macquarie, after the Yorkshire seaside resort, Bonnells Bay was known as Morisset East until 1948 when it was renamed for the bay on which it is situated. The bay, in turn, was named for the pioneer Bonnell family (Newcastle City Council Library, citing Lake Macquarie Past and Present). Croudace Bay was named after Thomas Croudace, manager of the Scottish Australian Mining Company who owned land in the area (Newcastle City Council Library, citing Lake Macquarie Herald, 26 November, 1970). Thomas Croudace built a home in the area called 'Leighinmohr'. Since there is a Leighinmohr House and Hotel in Ballymena, Northern Ireland, Croudace Bay probably has an Irish rather than a Scottish connection, though a distant link with Scotland cannot be ruled out. Many Scottish place names can also be found in those parts of the Hunter Valley to the north and west of the built-up metropolitan area. Examples include Aberdeen, Abernethy, Buchanan, Cessnock, Iona, Lochinvar, Melville, Paterson and Scone. These towns and suburbs have not been included in the present article since they are essentially rural or semi-rural communities beyond the main Newcastle-Lake Macquarie-Maitland conurbation. Lake Macquarie: History of Suburbs (on-line resource based on "Lake Macquarie: Past and Present", edited by Mrs Laurie Nilsen). Newcastle and Lower Hunter Valley Street Directory, 20th Edition (2008). (UBD, Universal Press Pty Ltd, Sydney). Wikipedia - List of Suburbs in Greater Newcastle, New South Wales.